Today I am delving into a topic that has nothing to do with food. I have been doing a lot of soul searching lately and trying to improve my life. I live a great life, but there is always room for self improvement! I have been really inspired by Crystal Paine and Jacqui McCoy lately about setting goals for yourself. Crystal does a great job outlining the process on her website and her awesome book. Jacqui has some of the most inspiring social media! I always look forward to her Instagram posts as part of my morning routine. 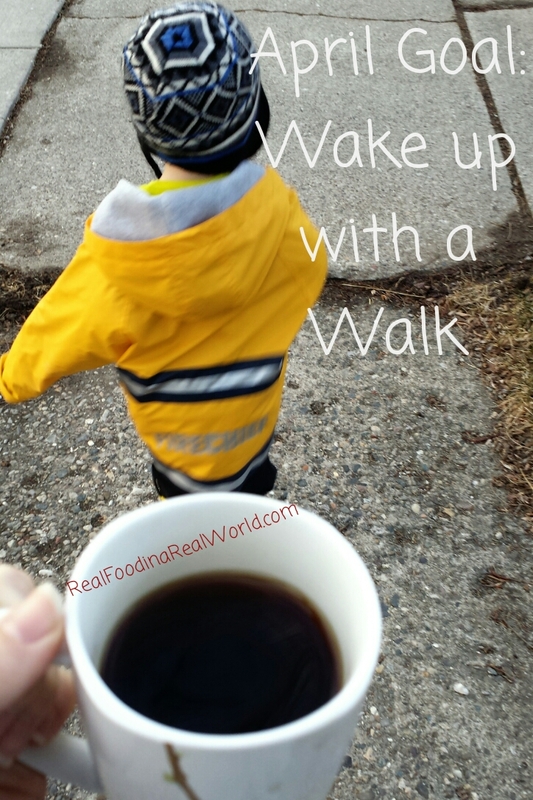 My goal for April is to wake up with a walk. This means get the coffee going, get appropriate weather gear on, and get out the door with my 3 year old. He is working through some sleep struggles right now (night waking/sleepwalking) so I have lots of excuses to lay on the sofa but I know this is a great way for us to get the day going. To set ourselves up for success, we are walking in pajamas. Some days he might be in some cartoon pants, but I consider this much easier than struggling to get him dressed at 7am. I sleep in gym clothes, so all we need is footwear and coats/hats to get out the door. Why am I sharing this? Two reasons: inspiration and accountability! I hope you find inspiration in goal setting and you are all my accountability partners! Do you set goals for yourself? What is your April goal?